It's the weekend! And, if you're in BC, it's our first every Family Day long weekend!! Unfortunately for me, my husband works in agriculture and they don't get stats so he'll be working on Monday which is the actual Family Day. We have plans to attend a special 4 year old's birthday though, so that will keep us from missing Daddy too much! I have two fun cards to share today! I made 8 of these for my church's birthday card ministry. This is the "boy" card. And this is the "girl" card. 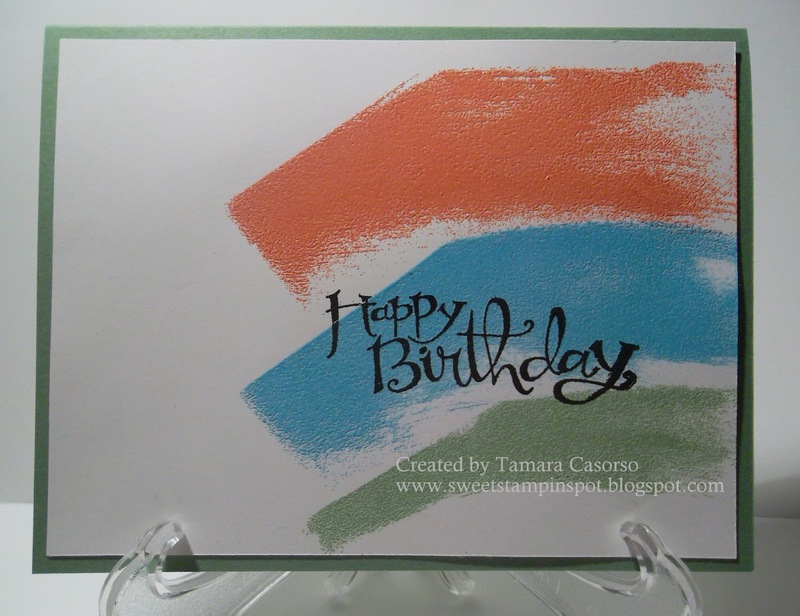 I just used 3 fun colours of embossing poweder to create a simple swiped background. I found it easiest to use one corner of the Versamark pad and just smear it to the edge of the paper. 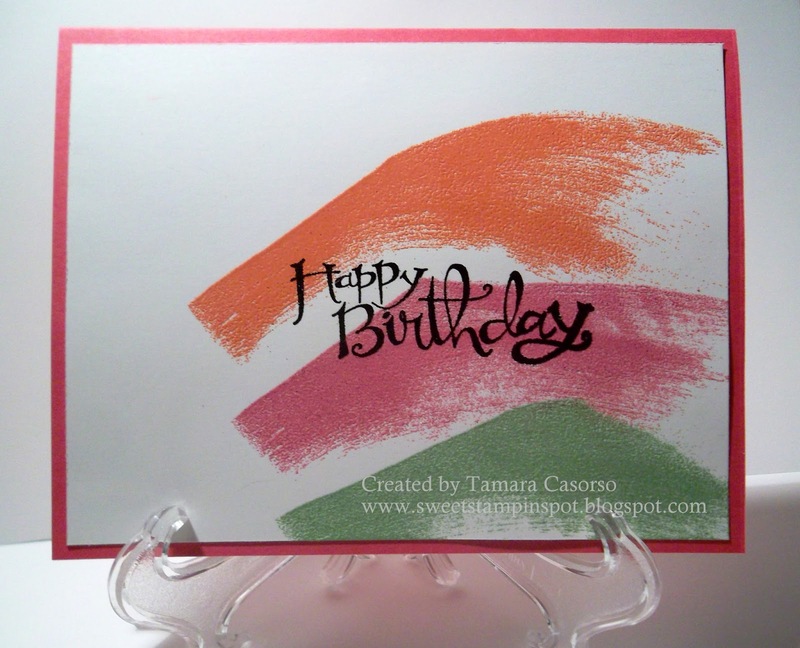 Do one swipe at a time and then pour your chosen colour of embossing powder on top. Shake off excess and heat set with your heat tool. Repeat the steps with the other two colours. 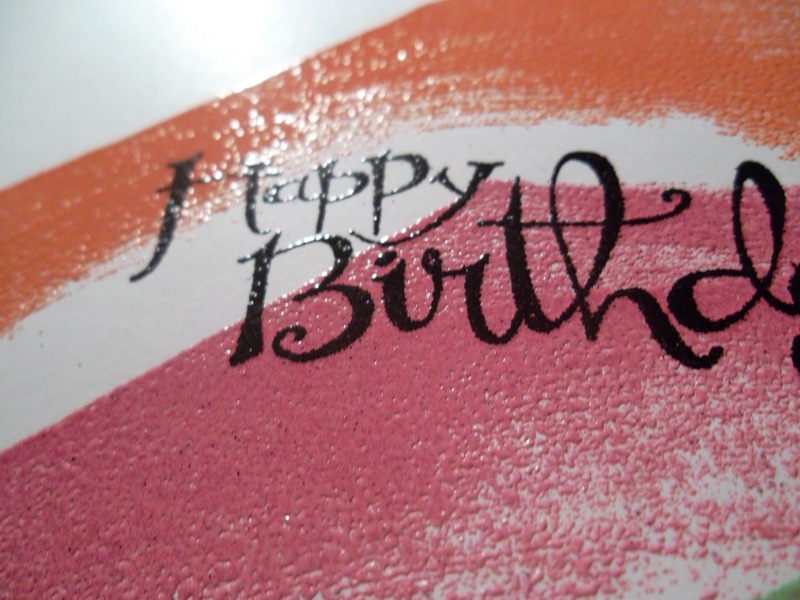 Once you're pleased with your background, just stamp a sentiment and use black embossing powder and heat set. I used the set Sassy Salutations. I had seen this card demonstrated at the Regional Conference in Tacoma, WA last fall. I love the simple but WOW this technique offers. Lots of fun and easy to duplicate! Hope you've enjoyed today's cards. If you have any questions, feel free to leave a comment!! What a fun, easy, and modern technique! I love it! You rock, Tamara! Thanks, Sara. The credit goes to Donna from the Home Office. She demonstrated this card and it was a definite wow for everyone in the room! BTW- we really missed you at Leadership this year!!! Whenever I see the embossed stuff, I really want to touch it! haha. Love the colours you chose, T!